MicroRNAs (miRNAs) are generally recognized as regulating gene expression posttranscriptionally by inhibiting translation or inducing target mRNA degradation. New mechanisms for miRNAs to regulate gene expression also still attract much attention. More and more novel miRNAs are discovered by the advanced sequencing technology, but yet their biological functions are largely unknown. Up to now, the function of miR-466l, a miRNA discovered in mouse embryonic stem cells, remains unclear. In this study, we report that miR-466l can upregulate both mRNA and protein expression of IL-10 in TLR-triggered macrophages. Furthermore, we show that miR-466l can competitively bind to the IL-10 3′ untranslated region AU-rich elements, which is a typical binding site for RNA-binding protein (RBP). Tristetraprolin is a well-known RBP, and mediates rapid degradation of IL-10 mRNA. miRNA always mediates target mRNA degradation or translation repression modestly; thus, the net effect of miR-466l’s binding to IL-10 AU-rich elements is to prevent IL-10 mRNA degradation mediated by tristetraprolin, resulting in extended t1/2 of IL-10 mRNA and elevated IL-10 expression. Thus, competitive binding with RBP to the same target mRNA and subsequent stabilization of target mRNA is an alternative mechanism for gene regulation by miRNAs. Also, a mechanism for regulation of IL-10 by miRNAs is outlined. MicroRNAs (miRNAs) are emerging as important, albeit poorly characterized, regulators of many kinds of biological processes (1, 2). In the immune system, miRNAs regulate the development and function of many immune cells (3, 4). Several miRNAs play important roles in innate immunity (5, 6) and adaptive immunity (7–9). Besides, miRNAs can also contribute to lymphoproliferative diseases and autoimmunity (10). It is well accepted that miRNAs regulate gene expression posttranscriptionally by repressing translation and/or inducing target mRNA degradation. However, investigation of other new mechanisms for miRNAs to regulate gene expression attracts much attention. More and more evidence shows that posttranscriptional regulation is as important as transcriptional regulation. These two regulation mechanisms cooperate to determine the gene expression levels. It was reported that the intrinsic stability of the mRNAs of inflammatory mediators, encoded in their 3′ untranslated region (3′UTR), partially directs the sequential initiation, propagation, and resolution of inflammation (11). The AU-rich elements (ARE) located in the 3′UTR of these inflammatory mediators can be regulated by both miRNAs and RNA-binding proteins (RBPs). For example, miR-16 and tristetraprolin (TTP) can cooperate to destabilize TNF-α mRNA by binding to its ARE (12). In LPS-activated macrophages, transcripts encoding cytokines, such as TNF-α, IL-1, IL-6, cyclooxygenase-2 (13), and CXCL1 (14), have ARE in their 3′UTR. TTP coordinately destabilizes these transcripts by recruiting the RNA decay machinery (15). TTP also can destabilize the anti-inflammatory cytokine IL-10 mRNA by binding to the ARE (16). It has been concluded that miRNAs mediate target mRNA degradation or translation repression modestly (17), whereas RBPs, such as TTP, can mediate rapid mRNA degradation (18, 19). Thus, whether and how miRNAs and RBPs can regulate each other and whether the target gene expression is under the control of both miRNAs and RBPs need to be further investigated. Now, more and more new miRNAs have been identified by the advanced sequencing technology (2, 20, 21). miR-466l was identified in embryonic stem (ES) cells by using high-throughput pyrosequencing (21). However, its function remains unknown to date. Through the miRanda algorithm (22, 23), many cytokines, chemokines, and growth factors are predicted to be the targets of miR-466l. The seed sequence of miR-466l is well complementary with the AUUUA pentamer, which is a characteristic sequence of ARE. Considering that the seed sequence of miR-16 is not complementary with TNF-α ARE (12), miR-16 synergizes TTP to recognize TNF-α ARE and then mediates TNF-α mRNA degradation by a nontypical miRNA function. It is intriguing what happens when miR-466l and TTP meet at the same binding sites. We demonstrate that miR-466l can upregulate IL-10 expression in TLR-triggered macrophages both at mRNA and protein levels. We further show that miR-466l occupies the binding sites of TTP in the IL-10 3′UTR ARE, thus preventing IL-10 mRNA degradation mediated by TTP and extending IL-10 mRNA t1/2. C57BL/6 mice (5–6 wk old) were purchased from SIPPR-BK Experimental Animal (Shanghai, China). All animal experiments were undertaken in accordance with the National Institutes of Health Guide for the Care and Use of Laboratory Animals, with the approval of the Scientific Investigation Board of Second Military Medical University (Shanghai, China). LPS, PGN, and actinomycin D (ActD) were from Sigma-Aldrich (St. Louis, MO). miR-466l mimics and control mimics were from GenePharma (Shanghai, China). TTP small interfering RNA (siRNA) and control siRNA were from Santa Cruz Biotechnology (Santa Cruz, CA). Mangna RNA-binding protein immunoprecipitaion (RIP) RBP immunoprecipitation kit was from Millipore (Billerica, MA). The IL-10 promoter was amplified from C57BL/6 genome DNA (5′-GCCAACGAAGATCCTCCCCCGTAC-3′ for forward primer and 5′-TAAGAGCAGGCAGCATAGCAGTGC-3′ for reverse primer) and subcloned into the PGL3-enhancer vector (Promega, Madison, WI) to generate IL-10-pro. The IL-10 3′UTR luciferase reporter vector (nor) was constructed by amplifying the mouse IL-10 mRNA 3′UTR and cloning into XbaI site of pGL3-promoter vector (Promega). The mutant IL-10 3′UTR (mut) was generated from the IL-10 3′UTR by mutating all of the four miR-466l potential binding sites. mut-1, mut-2, mut-3, and mut-4 were generated from IL-10 3′UTR by mutating the first, second, third, and fourth miR-466l binding site, respectively. All mutation reporter vectors were generated by changing ATTTA pentamer into ATGTA pentamer. The miR-466l with its flanking sequence was amplified from C57BL/6 genome DNA (5′-GTTCACTGCATGATGAGGTAGAGATC-3′ for forward primer and 5′-TGTCCCCGTACTGCATAATCTCTCAC-3′ for reverse primer) and subcloned into the UBC-pIRES2-EGFP vector to produce UBC-466l. All vectors were verified by sequencing. HEK293T, RAW264.7, and 3LL cell lines were obtained from American Type Culture Collection (Manassas, VA). HEK293T was cultured in DMEM containing 10% FCS. A total of 1 × 104 cells was seeded into 96-well plates and incubated overnight. JetSI-ENDO transfection reagents (Polyplus-transfection, Illkirch, France) were used for the cotransfection of plasmids and RNAs, according to the manufacturer’s instructions. Thioglycolate-elicited mouse peritoneal macrophages were prepared and cultured, as described previously (24). A total of 0.5 ml of 2 × 105 cells was seeded into each well of 24 well plates and incubated overnight, and then transfected with RNAs using INTERFERin (Polyplus-transfection), according to the manufacturer’s instructions. IL-10, TNF-α, IFN-β, and IFN-γ in the supernatants were measured with ELISA kits (R&D Systems, Minneapolis, MN). Total RNA was extracted with TRIzol (Invitrogen, Carlsbad, CA). qPCR analysis was performed using LightCycler (Roche, Basel, Switzerland) and SYBR Green Real-time PCR master mix (Toyobo, Osaka, Japan). For miRNA analysis, reverse-transcriptase primer for miR-466l was 5′-GTCGTATCCAGTGCAGGGTCCGAGGTATTCGCACTGGATACGACAAUAUG-3′. qPCR primers were 5′-ATGGCUAUAAAUACAUGCACA-3′ (forward) and 5′-GTGCAGGGTCCGAGGT-3′ (reverse). U6 small nuclear RNA was quantified using its reverse primers for reverse-transcriptase reaction and its forward and reverse primers for qPCR, which were 5′-CTCGCTTCGGCAGCACA-3′ (forward) and 5′-AACGCTTCACGAATTTGCGT-3′ (reverse). The relative expression level of miRNA was normalized by U6 expression with 2−ΔΔCt cycle threshold method. For β-actin, IL-10, TNF-α, and murine TTP (mTTP) mRNA analysis, the primers were as follows: 5′-AGTGTGACGTTGACATCCGT-3′ (β-actin forward), 5′-GCAGCTCAGTAACAGTCCGC-3′ (β-actin reverse), 5′-GCTCTTACTGACTGGCATGAG-3′ (IL-10 forward), 5′-CGCAGCTCTAGGAGCATGTG-3′ (IL-10 reverse), 5′-AAGCCTGTAGCCCACGTCGTA-3′ (TNF-α forward), 5′-GGCACCACTAGTTGGTTGTCTTTG-3′ (TNF-α reverse), 5′-TCGAAGAGACCCTAACCAGGC-3′ (mTTP forward), and 5′-GCGTAGTCATCAGGATCGGA-3′ (mTTP reverse). Annealing of all primers was done at 55°C. Data were normalized by the β-actin expression in each sample. Cells were lysed using M-PER protein extraction reagent (Pierce, Rockford, IL) supplemented with protease inhibitor mixture (Calbiochem, La Jolla, CA). Protein concentrations of the extracts were measured with a bicinchoninic acid assay (Pierce) and equalized with the extraction reagent. Equal amount of the extracts was loaded and subjected to SDS-PAGE, transferred onto nitrocellulose membranes, and then blotted, as described previously (24). RNA immunoprecipitation experiments were performed according to the protocol provided by the kit (Millipore; catalogue 17-701). Statistical significance was determined by Student’s t test, with values of p < 0.05 considered to be statistically significant. The seed sequence of miR-466l is AUAAAUA, which is complementary to the typical ARE sequences. Taking advantage of the miRanda algorithm (23) and TargetScan algorithm (25), we predicted that the cytokine genes that have multiple AUUUA pentamers can be targeted by miR-466l. Among them, TNF-α, IFN-γ, IFN-β, and IL-10 are potential targets of miR-466l because they have AUUUA pentamers in the 3′UTR. For example, IL-10 has the four binding sites of miR-466l (Fig. 1). Four miR-466l potential binding sites exist in IL-10 mRNA 3′UTR. 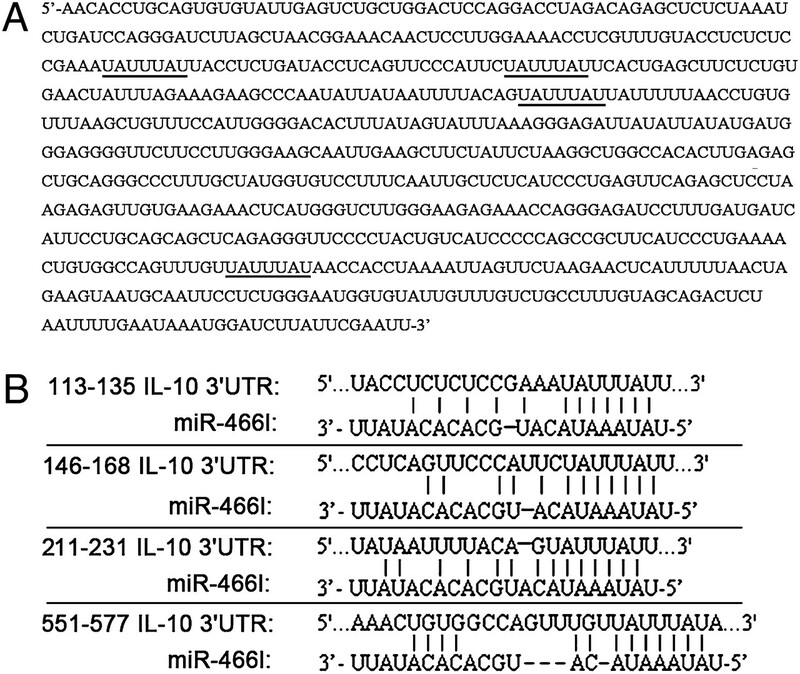 A, There are four miR-466l potential binding sites in IL-10 mRNA 3′UTR; the underlined sequences are reverse complementary to the seed sequence of miR-466l. B, The positions of the potential binding sites are 113–135, 146–168, 211–231, and 551–577, indicated as the first, second, third, and fourth binding sites, respectively. TLR-triggered macrophages were used to study the possible role of miR-466l in the regulation of cytokine production. As shown in Fig. 2A, RAW264.7 cells transfected with miR-466l mimics expressed much higher levels of mature miR-466l. We found that, interestingly, both IL-10 mRNA and protein levels were higher in the miR-466l-overexpressed RAW264.7 cells than that in mock control cells when these cells were stimulated with TLR ligands (Fig. 2B–D; Supplemental Fig. 1). The upregulation of IL-10 mRNA expression by miR-466l–expressing vector was dose dependent (Supplemental Fig. 2A). However, the protein levels of other cytokines, such as TNF-α, IFN-β, and IFN-γ, remained almost unchanged in TLR-triggered macrophages when transfected with miR-466l or mock control (Fig. 2E–G). In primary peritoneal macrophages, we obtained similar results (Fig. 2H). The 3LL murine lung cancer cells secrete IL-10 spontaneously and serum starvation induces 3LL cells to produce more IL-10; we took advantage of this system and found that more IL-10 was produced in the miR-466l–overexpressed 3LL cells than in mock control cells. Further experiments confirmed the upregulation of IL-10 by miR-466l in serum-starved 3LL cells (Supplemental Fig. 2B). Although miR-466l is highly expressed in ES cells, endogenous miR-466l expression is very low in macrophages (Supplemental Fig. 2D) and 3LL cells; we did not take miR-466l inhibitor to verify the effect of miR-466l on IL-10 gene expression. 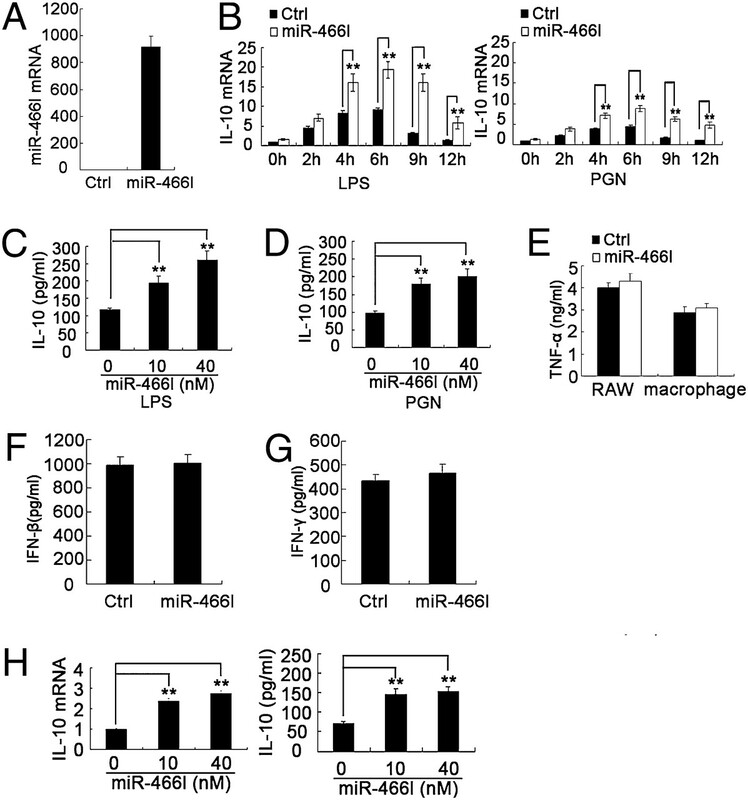 miR-466l upregulates mRNA and protein expression of IL-10 in TLR-triggered macrophages. A, RAW264.7 cells were transfected with miR-466l mimics or matched control at a final concentration of 10 nM. Twenty-four hours later, the expression of miR-466l was measured by qPCR and normalized by U6 small nuclear RNA in each sample. B, RAW264.7 cells were transfected, as described in A; 24 h later, these cells were stimulated with LPS (100 ng/ml) (left) or PGN (1 ug/ml) (right) for 2, 4, 6, 9, and 12 h, and then the IL-10 mRNA were measured by qPCR and normalized to the expression of β-actin mRNA in each sample. C and D, RAW264.7 cells were transfected with indicated amount of miR-466l mimics or matched control. Twenty-four hours later, these cells were stimulated with LPS (100 ng/ml) (C) or PGN (1 μg/ml) (D) for 12 h; IL-10 in supernatant was measured by ELISA. F and G, RAW264.7 cells or primary peritoneal macrophages were transfected, as described in A; 24 h later, these cells were stimulated with LPS (100 ng/ml) for 12 h, and the supernatant TNF-α (E), IFN-β (F), and IFN-γ (G) were measured by ELISA. H, Primary peritoneal macrophages were transfected with the indicated amount of miR-466l mimics or matched control; 24 h later, these cells were stimulated with LPS (100 ng/ml) for another 6 or 12 h. IL-10 mRNA in 6-h LPS-stimulated cells was measured by qPCR and normalized by β-actin mRNA in each sample (left). IL-10 in the culture supernatant of 12-h LPS-stimulated cells was measured by ELISA (right). The transfection efficiency of 10 nM miRNA mimics into RAW264.7 or primary macrophages was higher than 80% by using the FITC-labeled miRNA to detect the transfection efficiency. Data are shown as mean ± SEM of three independent experiments. **p < 0.01. In most cases, miRNA regulates translation repression and/or mRNA degradation of its target. It is unusual that miR-466l upregulates IL-10 production. We used the luciferase reporter systems to investigate whether miR-466l would bind to its predicted sites of IL-10 and upregulate the luciferase activity. Our data show that miR-466l did have effect on luciferase reporter vector with IL-10 3′UTR (nor), but the luciferase activity was down regulated, just as the effect of the most miRNAs on their targets (Fig. 3A). miR-466l impaired the IL-10 3′UTR reporter gene activity via the ARE, which is complementary with the miR-466l seed sequence, because miR-466l mimics could not reduce the luciferase activity of the mutant IL-10 3′UTR reporter gene (mut) (Fig. 3A). We further narrow down the critical binding site for miR-466l. We generated mut-1, mut-2, mut-3, and mut-4 by mutating four possible miR-466l binding sites, respectively, and repeated the reporter gene experiments in RAW264.7 cells with or without LPS stimulation. Our data show that in resting RAW264.7 cells, miR-466l downregulated the wild-type IL-10 3′UTR luciferase activity, but had no effect on that of mutant IL-10 3′UTR reporter gene. Down regulation of luciferase activity is unchanged if the first, second, or fourth potential miR-466l binding sites are mutated, whereas downregulation of luciferase activity is abolished if the third binding site is mutated (Fig. 3B). 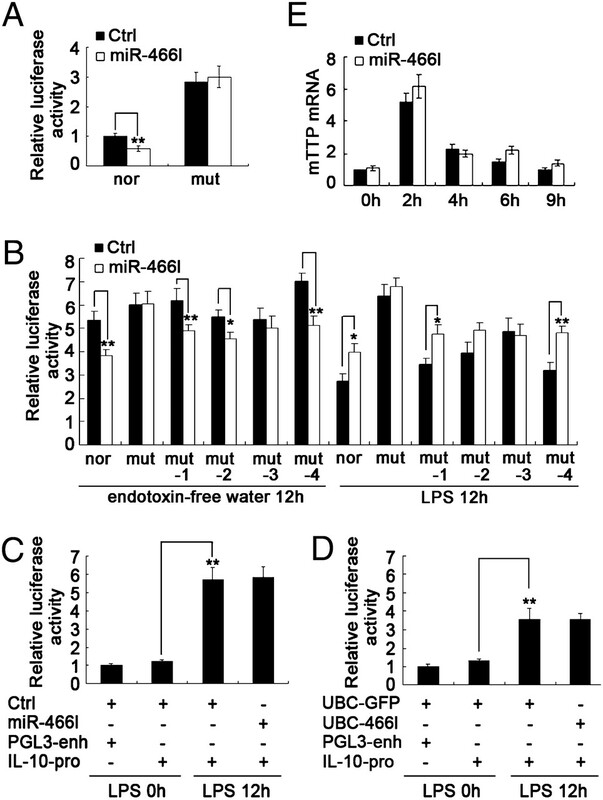 In LPS-stimulated RAW264.7 cells, miR-466l upregulated the wild-type IL-10 3′UTR luciferase activity, but had no effect on that of mutant IL-10 3′UTR reporter gene. The first and fourth mutation of potential miR-466l binding sites did not block the upregulation of luciferase activity, whereas the second and third mutation abolished the upregulation of luciferase activity caused by miR-466l (Fig. 3B). According to the above results, miR-4661 decreased luciferase activity in resting RAW264.7 cells while increasing IL-10 3′UTR luciferase activity in LPS-stimulated RAW264.7 cells. The third potential binding site of miR-466l in IL-10 3′UTR may be the key position for miR-466l regulation, and the second binding site may also have some contributions. miR-466l directly targets IL-10 3′UTR rather than IL-10 promoter. A, 293T cells were cotransfected with 20 nM miR-466l mimics or 20 nM matched control, 120 ng of indicated vectors, and 12 ng of pRL-TK. After 24 h, firefly luciferase activity was measured and normalized by Renilla luciferase activity. B, RAW264.7 cells were cotransfected with 20 nM miR-466l mimics or 20 nM matched control, 120 ng of indicated vectors, and 12 ng of thymidine kinase; after 24 h, these cells were stimulated with endotoxin-free water or LPS (100 ng/ml) for another 12 h, and then the firefly luciferase activity was measured and normalized by Renilla luciferase activity. C, RAW264.7 cells were cotransfected with 20 nM miR-466l mimics or 20 nM matched control, 500 ng of indicated vectors, and 50 ng of thymidine kinase. Twenty-four hours later, these cells were stimulated with LPS (100 ng/ml) for 0 or 12 h. Firefly luciferase activity was measured and normalized by Renilla luciferase activity. D, RAW264.7 cells were cotransfected with 500 ng of UBC-466l or UBC-GFP, 500 ng of indicated vector, and 50 ng of thymidine kinase. Twenty-four hours later, these cells were stimulated with LPS (100 ng/ml) for 0 or 12 h. Firefly luciferase activity was measured and normalized by Renilla luciferase activity. E, RAW264.7 cells were transfected with miR-466l mimics or matched control at a final concentration of 10 nM. Twenty-four hours later, these cells were stimulated with LPS (100 ng/ml) for 2, 4, 6, and 9 h, and TTP mRNA were measured by qPCR and normalized by β-actin mRNA in each sample. Data are shown as mean ± SEM of three independent experiments. Data of A–D are shown as mean ± SD (n = 6) of one representative experiment. Similar results were obtained in three independent experiments. *p < 0.05; **p < 0.01. pRL-TK, thymidine kinase promoter-Renilla luciferase reporter plasmid. IL-10 can be regulated both transcriptionally and posttranscriptionally. The reporter gene experiments above just indicated the posttranscriptional regulation. To address whether miR-466l could upregulate IL-10 by affecting its transcription, we constructed an IL-10 promoter luciferase reporter gene, which contains 1205 bp of IL-10 mRNA 5′UTR. The luciferase activity was much higher in the LPS-stimulated RAW264.7 cells than that in the untreated cells, suggesting that the IL-10 promoter reporter is functional. However, we did not see any difference in luciferase activity between the miR-466l–overexpressed RAW264.7 cells and its mock control cells (Fig. 3C and 3D). Because most transcriptional regulator binding sites locate within the 1205 insert of the promoter reporter vector (26, 27), the results of IL-10 promoter reporter gene partially suggest that miR-466l has little effect on the IL-10 transcription. It was shown recently that bone marrow-derived macrophages from TTP-deficient mice have longer IL-10 mRNA t1/2 than the cells from wild-type mice, indicating that IL-10 can be regulated by TTP in a posttranscriptional manner (16). It is possible that miR-466l upregulates IL-10 expression by downregulating TTP. We examined the TTP mRNA level in LPS-stimulated RAW264.7 cells. There was no difference in TTP expression between the miR-466l–transfected cells and matched control cells (Fig. 3E), suggesting that the upregulation of IL-10 by miR-466l is not the consequence of lower TTP expression. Taken together, the results demonstrate that upregulation of IL-10 expression by miR-466l mostly likely occurs posttranscriptionally and may be directly. In TLR-triggered macrophages, the IL-10 mRNA level is upregulated in miR-466l–transfected cells compared with the mock control-transfected cells. The fold increase of upregulation was more obvious in the latter phase of LPS or PGN stimulation (Fig. 2B), indicating miR-466l may extend IL-10 mRNA t1/2. The ActD, a transcription inhibitor, was applied to block IL-10 transcription 6 h after LPS or PGN stimulation. More expression fold increase could be found in the latter phase of ActD treatment, from 2- to 3-fold increase to 4- to 5-fold increase. We took the data from three independent experiments to calculate the t1/2 of IL-10 mRNA. IL-10 mRNA in miR-466l-transfected RAW264.7 cells had a longer t1/2, no matter if stimulated with LPS (Fig. 4A) or PGN (Fig. 4B). These data suggested that miR-466l could extend the IL-10 mRNA t1/2, which may be the main cause of miR-466l–mediated upregulation of IL-10 expression. miR-466l upregulates IL-10 gene expression in TLR-triggered macrophages by extending IL-10 mRNA t1/2. RAW264.7 cells were transfected with miR-466l mimics or matched control at the final concentration of 10 nM. Twenty-four hours later, these cells were stimulated with LPS (100 ng/ml) (A) or PGN (1 μg/ml) (B) for 6 h, the culture medium was changed, and then 10 μg/ml ActD was used to treat these cells for 1, 2, or 3 h. The IL-10 mRNA were measured by qPCR and normalized by β-actin mRNA (left). The data of three independent experiments were taken to calculate the IL-10 mRNA t1/2 (right). Data are shown as mean ± SEM of three independent experiments. *p < 0.05; **p < 0.01. The AUUUA pentamers located in ARE of the IL-10 3′UTR can be bound by miR-466l, and these pentamers are also the typical binding sites of TTP. TTP can shorten the IL-10 mRNA t1/2, but miR-466l can extend it. It has been reported that miR-16 and TTP cooperate to degrade TNF-α mRNA (12). There are also predicted models for RBP and miRNA binding to the same target (28). To determine whether miR-466l and TTP compete the same binding sites of IL-10 3′UTR, an efficient siRNA targeting TTP was applied (Fig. 5A and 5B). In TTP-silenced RAW264.7 cells, upregulation of TNF-α is found at the early phase, whereas upregulation of IL-10 mRNA is found at late phase of LPS stimulation (Fig. 5C and 5D). The upregulation of TNF-α and IL-10 after TTP silencing is also coherent with TTP targeting TNF-α and IL-10 (16, 29). miR-466l cannot upregulate IL-10 gene expression in TLR-triggered macrophages after silencing of TTP. A, RAW264.7 cells were transfected with 5 or 10 nM TTP siRNA (si-mTTP). Twenty-four hours later, IL-10 mRNA was measured by qPCR and normalized by β-actin mRNA. B, RAW264.7 cells were transfected with 5 nM si-mTTP. Twenty-four hours later, these cells were stimulated with LPS (100 ng/ml) for 1, 2, 4, or 8 h; TTP mRNA levels were measured by qPCR and normalized by β-actin mRNA. C and D, RAW264.7 cells were treated as described in B, and then were stimulated with LPS for indicated times; TNF-α mRNA levels (C) and IL-10 mRNA level (D) were measured by qPCR and normalized by β-actin mRNA. E and F, RAW264.7 cells were cotransfected with 10 nM indicated miRNA or siRNA. Twenty-four hours later, these cells were stimulated with LPS (100 ng/ml) for 6 or 12 h, and IL-10 mRNA level was measured by qPCR and normalized by β-actin mRNA (E). The culture supernatant of cells stimulated with LPS for 12 h was measured by ELISA (F). Data are shown as mean ± SEM of three independent experiments. **p < 0.01. There was no IL-10 mRNA difference between the miR-466l–transfected and its mock control-transfected RAW264.7 cells after TTP interfering, although we haven’t found miR-466l downregulated IL-10 mRNA as we found in the IL-10 3′UTR reporter system (Fig. 5E and 5F). miR-466l cannot upregulate IL-10 gene expression after silencing TTP; therefore, we hypothesized the following: miR-466l may antagonize TTP-mediated IL-10 mRNA degradation, and thus upregulates IL-10 expression. To test this hypothesis, we performed the RNA immunoprecipitation experiments. We used TTP Ab to isolate the RNA bound to TTP. TTP Ab precipitated large amount of IL-10 mRNA and TNF-α mRNA, whereas control IgG did not. In the immunoprecipitate, IL-10 mRNA level is lower in miR-466l–transfected cells than that of mock control-transfected cells, although the TNF-α mRNA level showed no difference between the two groups (Fig. 6A and 6B). IL-10 mRNA level was higher in miR-466l–transfected cells than that of mock control-transfected cells in the supernatant after TTP Ab immunoprecipitation, whereas the TNF-α mRNA level showed no difference between the two groups in the supernatant (Supplemental Fig. 3). It is well accepted that miRNAs mediate the RNA degradation or translation repression slightly (17), whereas the RBP, such as TTP, plays a very important role in the feedback of the inflammatory response and it degrades RNA rapidly (18, 19). The accumulation of miR-466l leads to the formation of more RNA-induced silencing complexes (RISC), allowing more ARE of IL-10 mRNA occupied by the RISC, reducing the chance of TTP-containing complexes binding to ARE. In the miR-466l–overexpressed cells, IL-10 mRNA ARE is mainly bound by miR-466l–containing RNA-induced silencing complexes; thus, degradation is lower than that in mock control cells, in which IL-10 mRNA ARE is mainly bound by TTP. miR-466l interferes with the binding of TTP and IL-10 mRNA, antagonizing TTP-mediated IL-10 mRNA degradation. A and B, RAW264.7 cells were transfected with 10 nM miR-466l or 10 nM matched control; 24 h later, these cells were stimulated with LPS (100 ng/ml) for 4 h. Cells (1 × 107) were lysed with 100 μl of RIP lysis buffer. A total of 5 μg of anti-TTP or 5μg of IgG was added to the RIP lysate, and incubated all the tubes with rotating overnight at 4°C. The RNA in the immunoprecipitate was isolated, and IL-10 mRNA (A) and TNF-α mRNA (B) were measured by qPCR and normalized by the β-actin mRNA, which was isolated from the RAW264.7 cells transfected with matched miRNA mimics and stimulated with LPS for 4 h. Data are shown as mean ± SEM of three independent experiments. **p < 0.01. C, In normal condition, TTP destabilizes the IL-10 mRNA strongly, and shortens the t1/2 of IL-10 mRNA. The accumulation of miR-466l will force many miR466l-containing RISCs to bind to the ARE of the IL-10 mRNA 3′UTR. The binding sites of the miR-466l are also the position of TTP-containing complex binding. miR-466l mediates IL-10 degradation, but more slightly than the TTP does. In sum, miR-466l upregulates IL-10 expression by preventing RBP TTP-mediated IL-10 mRNA degradation. In conclusion, we demonstrate that miR-466l can upregulate IL-10 expression in TLR-triggered macrophages by antagonizing RBP TTP-mediated IL-10 mRNA degradation, and the working model we proposed is shown in Fig. 6C. IL-10 is one of the important regulators of the immune system that has been shown to be anti-inflammatory in many model systems (30). It is secreted by various cell types, such as Th2 cells, regulatory T cells, B cells, macrophages, dendritic cells, mast cells, and eosinophils. It mediates lots of immunoregulatory events, such as negative regulation of maturation and activation of macrophages and dendritic cells, inhibition of T cell activation, suppression of cytokine synthesis, and Ab production (31, 32). Also, dysregulation of IL-10 leads to various immunological diseases, such as cancer, rheumatoid arthritis, asthma, infectious disorders, etc. (33). Therefore, it is essential that IL-10 expression is tightly regulated. Regulation of IL-10 expression occurs at the transcriptional and posttranscriptional levels. Although Sp1 and Sp3 have been found to regulate transcription, it has been shown that IL-10 mRNA is constitutively transcribed in many cells (33, 34); however, the availability of its protein is significantly determined by posttranscriptional mechanisms. ARE in the 3′UTR of mouse IL-10 that leads to the degradation of its mRNA have been identified (35). miR-106a can bind the IL-10 3′UTR and regulate its expression posttranscriptionally (36). Besides, genetic variations in the IL-10 3′UTR has been shown to be associated with IL-10 levels that could lead to disease pathogenesis (37, 38). Therefore, a full understanding of the posttranscriptional regulation of IL-10 expression will be of scientific and clinical significance. In this study, we found that miR-466l has well complementary seed sequence with the ARE motif, which is characterized by AUUUA pentamers. In TLR-triggered macrophages, miR-466l can upregulate IL-10 both at mRNA and protein levels by extending IL-10 mRNA t1/2. miR-4661 decreased luciferase activity in an IL-10 3′UTR-specific manner in HEK293T and resting RAW264.7 cells while increasing IL-10 3′UTR luciferase activity in LPS-stimulated RAW264.7 cells. Based on our finding, the following mechanism was proposed: miR-466l antagonizes TTP-mediated IL-10 mRNA degradation, resulting in extended IL-10 mRNA t1/2. Upregulation of IL-10 in TLR-triggered macrophages is the net effect of the regulation by miR-466l and TTP. RBPs and miRNAs are two key regulators in the posttranscriptional regulation of genes. They will synergize or antagonize each other. 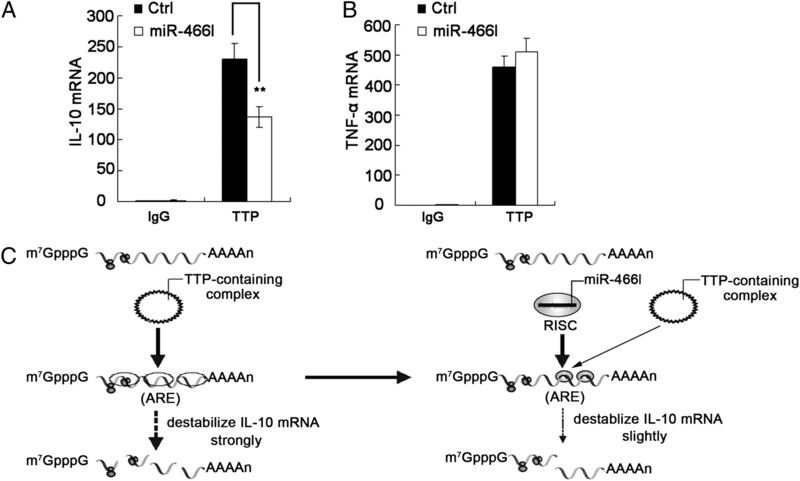 miR-16 and TTP cooperatively to degrade ARE-containing mRNA. The regulation of miR-16 in ARE-containing mRNA is sequence-specific and requires ARE-binding protein TTP. TTP does not directly bind to miR-16, but instead it binds to miR-16 through association with Ago/eiF2C family members and assists its targeting to ARE (12). Because we did not detect TTP in Argonaute (AGO)2 immunoprecipitate in miR-466l–transfected macrophages (data not shown), miR-466l and miR-16 may not share the same mechanism to regulate their respective targets. miR-122 can inhibit cationic amino acid transporter 1 mRNA and reporters bearing its 3′UTR in human hepatocarcinoma cells subjected to different stress conditions. HuR, an ARE-binding protein, can stabilize its target mRNA. HuR is proved to reverse the miR-122–mediated cationic amino acid transporter 1 repression (39). This study not only determined that miRNA-mediated repression is a reversible process, but also proposed that miRNAs and RBPs may bind the same target and participate in posttranscriptional regulation together. 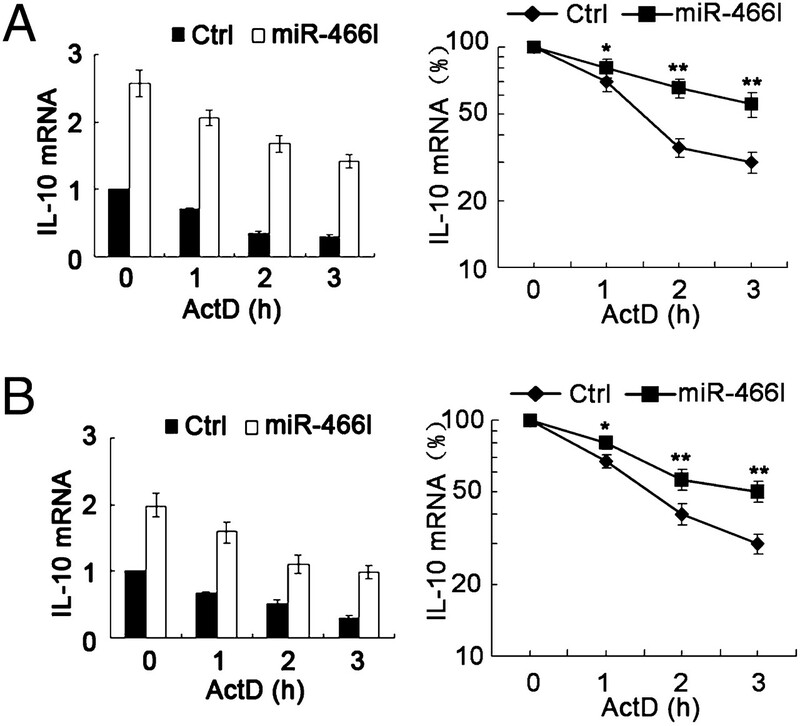 IL-10 upregulation by miR-466l is another example of competition between miRNAs and RBPs. Our study suggested that RBP-mediated mRNA degradation can be delayed by miRNA and the net effect is the upregulation of target gene. Vasudevan et al. (40) reported that miR-369-3 can switch target mRNA from repression to activation. As shown in the study, miR-369-3 can upregulate translation by recruiting AGO and fragile X mental retardation-related protein 1, factors associated with microribonucleoproteins. But these results cannot rule out the possibility that miR-369-3 and a RBP can antagonize each other and switch target gene on or off, the mechanism as we have proposed. RISC is a big and complicated complex. It must contain an AGO protein capable of endonucleolytic cleavage. AGO proteins bound to miRNAs, and their target mRNAs accumulate in processing bodies (P-bodies), cytoplasmic foci that are known sites of mRNA degradation (41). TTP coordinately destabilizes ARE-containing mRNA by recruiting the RNA decay machinery to the P-bodies. miRNA and TTP may locate in the same or separate P-bodies. Separate P-bodies may antagonize each other if they bind to the same or nearby target sequence. miR-466l and TTP may locate in separate P-bodies, and these two P-bodies compete for the binding to the ARE of IL-10 mRNA. There are many ARE-containing mRNAs predicted to be the targets of miR-466l. We verified several predicted targets with the TLR-triggered macrophage system and the 3′UTR luciferase reporter gene system. Only a few of the predicted targets can be regulated by miR-466l, and IL-10 is a solid candidate in both systems. miR-466l can downregulate some predicted targets, such as TNF-α in reporter gene system, but has no influence on TNF-α in TLR-triggered macrophages. Whether miR-466l can regulate its predicted target in vivo may be determined by the secondary structure of the target gene mRNA. miR-466l was discovered in ES cell by high-throughput pyrosequencing. It is relatively highly expressed in ES cells, but endogenous miR-466l expression is very low in macrophages and 3LL cells, so we did not take miR-466l inhibitor to verify the effect of miR-466l on IL-10 production. Although we have proved miR-466l can upregulate IL-10 in TLR-triggered macrophages, the role of miR-466l in ES cells is still unknown. IL-10 is present at the maternal-fetal interface (42) and may be important for ES cell immunosuppressive properties. Placental cytotrophoblasts, which are derived from ES cells, can produce the immunosuppressive cytokine IL-10 (43). Whether or not miR-466l may regulate IL-10 in these cells needs to be further investigated. In addition, the role of IL-10 regulation by miR-4661 in immune homeostasis, autoimmune diseases, and even ES immune-privileged process needs to be investigated in the future with respect to the physiological and pathophysiological significance. We thank Mei Jin and Yan Li for excellent technical assistance and Drs. Jin Hou, Li Lin, Qian Zhang, Taoyong Chen, and Jun Tian for helpful discussion. This work was supported by grants from the National Key Basic Research Program of China (2007CB512403, 2009CB521902), National Natural Science Foundation of China (30721091, 30710302), National High Biotechnology Development Program of China (2009ZX09503-003), and Shanghai Committee of Science and Technology (06DJ14011).
. 2004. MicroRNAs: small RNAs with a big role in gene regulation. Nat. Rev. Genet. 5: 522–531.
. 2008. Application of massively parallel sequencing to microRNA profiling and discovery in human embryonic stem cells. Genome Res. 18: 610–621.
. 2008. MicroRNAs: new regulators of immune cell development and function. Nat. Immunol. 9: 839–845.
. 2010. Physiological and pathological roles for microRNAs in the immune system. Nat. Rev. Immunol. 10: 111–122.
. 2009. MicroRNA-146a feedback inhibits RIG-I-dependent type I IFN production in macrophages by targeting TRAF6, IRAK1, and IRAK2. J. Immunol. 183: 2150–2158.
. 2010. Negative regulation of TLR4 via targeting of the proinflammatory tumor suppressor PDCD4 by the microRNA miR-21. Nat. Immunol. 11: 141–147.
. 2010. An emerging player in the adaptive immune response: microRNA-146a is a modulator of IL-2 expression and activation-induced cell death in T lymphocytes. Blood 115: 265–273.
. 2009. MicroRNA miR-326 regulates TH-17 differentiation and is associated with the pathogenesis of multiple sclerosis. Nat. Immunol. 10: 1252–1259.
. 2009. An endogenous positively selecting peptide enhances mature T cell responses and becomes an autoantigen in the absence of microRNA miR-181a. Nat. Immunol. 10: 1162–1169.
. 2008. Lymphoproliferative disease and autoimmunity in mice with increased miR-17-92 expression in lymphocytes. Nat. Immunol. 9: 405–414.
. 2009. The stability of mRNA influences the temporal order of the induction of genes encoding inflammatory molecules. Nat. Immunol. 10: 281–288.
. 2005. Involvement of microRNA in AU-rich element-mediated mRNA instability. Cell 120: 623–634. 2009. Intrinsic mRNA stability helps compose the inflammatory symphony. Nat. Immunol. 10: 233–234.
. 2008. 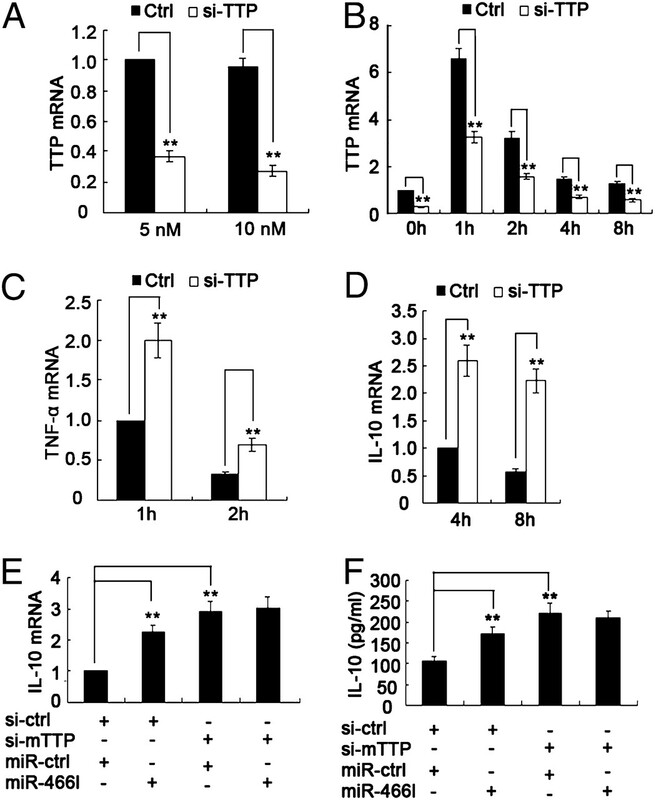 Tristetraprolin regulates CXCL1 (KC) mRNA stability. J. Immunol. 180: 2545–2552.
. 2005. Multiple processing body factors and the ARE binding protein TTP activate mRNA decapping. Mol. Cell 20: 905–915.
. 2008. Genome-wide analysis identifies interleukin-10 mRNA as target of tristetraprolin. J. Biol. Chem. 283: 11689–11699.
. 2008. Micromanagement of the immune system by microRNAs. Nat. Rev. Immunol. 8: 120–130.
. 1999. Evidence that tristetraprolin binds to AU-rich elements and promotes the deadenylation and destabilization of tumor necrosis factor α mRNA. Mol. Cell. Biol. 19: 4311–4323.
. 2005. Recruitment and activation of mRNA decay enzymes by two ARE-mediated decay activation domains in the proteins TTP and BRF-1. Genes Dev. 19: 351–361.
. 2009. Identification of the human mature B cell miRNome. Immunity 30: 744–752.
. 2007. RNA sequence analysis defines Dicer’s role in mouse embryonic stem cells. Proc. Natl. Acad. Sci. USA 104: 18097–18102.
. 2004. Human microRNA targets. PLoS Biol. 2: e363.
. 2008. The microRNA.org resource: targets and expression. Nucleic Acids Res. 36(Database issue): D149–D153.
. 2008. CaMKII promotes TLR-triggered proinflammatory cytokine and type I interferon production by directly binding and activating TAK1 and IRF3 in macrophages. Blood 112: 4961–4970.
. 2005. Conserved seed pairing, often flanked by adenosines, indicates that thousands of human genes are microRNA targets. Cell 120: 15–20.
. 2003. cAMP-induced interleukin-10 promoter activation depends on CCAAT/enhancer-binding protein expression and monocytic differentiation. J. Biol. Chem. 278: 5597–5604.
. 2006. Dynamic and transient remodeling of the macrophage IL-10 promoter during transcription. J. Immunol. 177: 1282–1288.
. 2006. MicroRNA modulation of RNA-binding protein regulatory elements. RNA Biol. 3: 57–59.
. 1998. Feedback inhibition of macrophage tumor necrosis factor-α production by tristetraprolin. Science 281: 1001–1005.
. 2003. Interleukin-10 therapy—review of a new approach. Pharmacol. Rev. 55: 241–269.
. 2007. TH1 cells control themselves by producing interleukin-10. Nat. Rev. Immunol. 7: 425–428.
. 2000. IL-10 gene expression is controlled by the transcription factors Sp1 and Sp3. J. Immunol. 165: 286–291.
. 2000. Posttranscriptional regulation of IL-10 gene expression through sequences in the 3′-untranslated region. J. Immunol. 165: 292–296.
. 2009. Posttranscriptional regulation of interleukin-10 expression by hsa-miR-106a. Proc. Natl. Acad. Sci. USA 106: 5761–5766.
. 2004. Transcription of the IL10 gene reveals allele-specific regulation at the mRNA level. Hum. Mol. Genet. 13: 1755–1762.
. 2004. IL10 gene polymorphisms are associated with asthma phenotypes in children. Genet. Epidemiol. 26: 155–165.
. 2007. Switching from repression to activation: microRNAs can upregulate translation. Science 318: 1931–1934.
. 2007. microRNA functions. Annu. Rev. Cell. Dev. Biol. 23: 175–205.
. 1993. Synthesis of T helper 2-type cytokines at the maternal-fetal interface. J. Immunol. 151: 4562–4573.
. 1996. Human placental cytotrophoblasts produce the immunosuppressive cytokine interleukin 10. J. Exp. Med. 184: 539–548.